A slim, elegant neck line can create a trim appearance and balance the overall effect of the entire body. Tired of wearing scarves or taking cover under a turtleneck? Your genetic make-up and/or weight fluctuations will greatly affect the types of changes you see in the mirror. Neck liposuction is a simple and highly effective procedure that can help create a beautiful natural –looking neck line if you have a mild amount of excess fat. This procedure can also be combined with Ultherapy to improve the skin laxity. This procedure is particularly beneficial for patients between the ages of 20 and 40. Patients in their 50’s and 60’s may also be good candidates, unless there is a significant skin laxity. In this case, an Ultherapy treatment may also be recommended. Dr. Ricciardelli has over 25 years of facial surgery experience and keenly aware of what is crucial to help restore a well-defined, elegant, and youthful appearance. “Whether you have minor fullness or a combination of loose skin and fullness, I can help you choose a procedure or combination of procedures to produce outstanding results,” says Dr. Ricciardelli. There is no substitution for experience and understanding when you are considering facial surgery. No two faces are alike and Dr. Ricciardelli’s approach to your surgery will depend on your anatomy and the results that you desire. Is neck liposuction for me? If you are bothered by a fullness in your neck then neck liposuction surgery may be for you. Dr. Ricciardelli appreciates and understands the nuanced relationships between facial structure and skin. 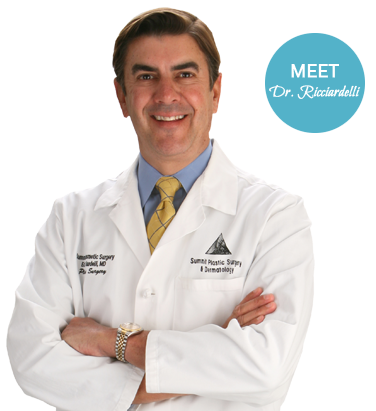 Dr. Ricciardelli take meticulous care to ensure that your incisions are well-concealed. Your options for neck restoration will be discussed at length during your cosmetic consultation. Can I have another procedure done at the same time? Yes. A neck liposuction is often combined with other procedures as part as a comprehensive approach to facial rejuvenation. Most often neck liposuction is combined with an eyelid lift, brow lift, facelift, mini facelift, chin augmentation, laser skin resurfacing, dermal fillers, and chemical peels. These procedures can be done before, after or during your surgery. Dr. Ricciardelli will discuss these or other procedures that you might be interested in during your cosmetic consultation. At your consultation, Dr. Ricciardelli will examine your neck, paying particular attention to facial structure, skin laxity and quality, and the degree of fullness in your neck. Your goals and expectations will be discussed thoroughly. There are several options to restore the neck depending on your anatomy and distribution of fat. Often Dr. Ricciardelli will recommend that you start a skincare regime for before and after your procedure to enhance the overall effect. You may be asked to stop medications that increase your chances of bruising. Feel free to bring a list of questions. We love an informed patient. Dr. Ricciardelli will let you know what to expect before, during and after your procedure and answer all of your questions. Your privacy and safety are very important to us. On the day of your surgery you will park in a designated, convenience space in back of the Summit building close to the private back door entrance of our office. Your surgery will most likely be performed in our AAAASF (Association for Accreditation of Ambulatory Surgery Facilities) certified operating suite. Your surgery may take up to one hour depending on the procedure. Most likely, you will have local numbing anesthesia for neck liposuction unless you are combining it with another procedure. Our recovery nurse will make sure that you are comfortable and inform your designated driver when you are ready to return to the comfort of your own home that day. You will be given detailed instructions for your specific needs. Most patients do not complain of pain after surgery but a mild discomfort. On average, most patients are able to return to work in 2 days and begin light exercising in 1 week. A lot will depend on your level of activity at work. You will be seen back in the office after surgery. Expect to have possible bruising, swelling and tenderness after surgery. Dr. Ricciardelli will call you in the evening to check-in on your progress as well as see you back in the office for your post-operative visits. Our door is always open for any questions. Why should I choose Summit Plastic Surgery & Dermatology? It’s about confidence: confidence in your surgeon, confidence that your wishes and individual concerns will be heard, and confidence you will get the results you want. Dr Ricciardelli has the experience and reputation that ensures you are trusting in a surgeon with a known track record in Wilmington and the qualifications and certifications that recognize him on a regional and national level.